MJM PVC Single Bag Hamper, by MJM International, is a deluxe, economic laundry hamper designed of healthcare-grade polymer plastic, with a single spacious bag that has a zipper front opening to prevent back injuries that may result from the bending over typical with other hampers. The reinforced casters allow the hamper to be easy to move when either empty or full. 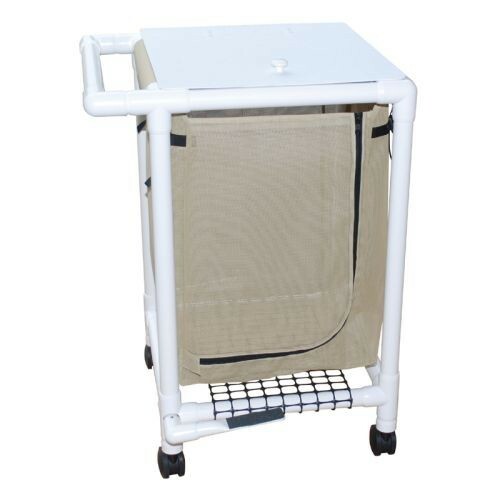 MJM PVC Single Bag Hamper features a high impact plastic lid with rubber bumper pads designed to eliminate banging noise when closed, eliminating disturbing, disruptive sounds for patients and caregivers. The marine-grade wire frame will support isolation liners or leak-proof bags. Available with optional foot pedal. Vitality Medical also carries other related items, such as the Single Bag Hamper with Universal Lid and the Adjustable Steel Hamper Stand. Zipper Front Opening Will Facilitate and Eliminate Lifting Heavy Loads. Floor Plate Will Support Retainer Bag. Marine Grade Wire Frame Will Support Isolation Liners or Leak-proof Bags. High Impact Plastic Lid with Handle Eliminates Noise When Closing. Zipper Front Opening Helps Prevent Back Injuries.